Tom Udall: GOP economics means record gas prices & record deficit. Barack Obama: Keep the promise of equal pay for an equal day�s work. Barack Obama: Invest in early childhood education and higher education. Barack Obama: Drilling is a stop-gap measure, not a long-term solution. Al Gore: We have the energy solution to solve the climate crisis. Al Gore: McCain has abandoned his support of pollution caps. Barack Obama: Help families with paid sick days and better family leave. Joe Biden: The US is less secure and more isolated in recent history. Joe Biden: Even Bush recognizes we should talk to Iran. Barack Obama: Eliminate government programs that no longer work. Barack Obama: Ban insurance companies from discriminating against the sick. Ted Kennedy: Quality health care is a fundamental right, not a privilege. Mark Warner: Bring high-tech, well-paying jobs to small towns. Barack Obama: We�re more decent & compassionate than last 8 years. Barack Obama: Ordinary people found the courage to keep the promise alive. Barack Obama: The Ownership Society really means �you�re on your own�. Barack Obama: Measure progress by observing how ordinary people are doing. Barack Obama: Our government must keep the promise of America. Barack Obama: Fulfilling America�s promise means individual participation. Barack Obama: To John McCain: We all put our country first. Barack Obama: The Republicans make a big election about small things. Barack Obama: The American promise is our greatest inheritance. Barack Obama: The destiny of all Americans is inextricably linked. Hillary Clinton: Confidence and optimism enable us to meet our challenges. Hillary Clinton: McCain and Bush are awfully hard to tell apart these days. Hillary Clinton: Have faith in God, in our country, and in each other. Joe Biden: Failure is at times inevitable but giving up is unforgivable. Joe Biden: Everyone is your equal, and everyone is equal to you. 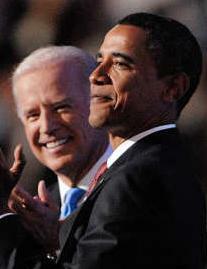 Joe Biden: We need a wise leader like Obama, not just a good soldier. Joe Biden: We should embrace change just like the previous generations. Bill Clinton: Rebuild the American dream and restore American leadership. Mark Warner: It�s �the future v. the past� not �liberal v. conservative�. Ted Kennedy: Work begins anew; hope rises again; and the dream lives on. Jeff Merkley: Change direction and put America back on track. Barack Obama: Tax cut for 95% of all working families, not corporations. Barack Obama: McCain says he�d follow Laden to hell; but not to his cave? Barack Obama: You don�t defeat a terrorist network by occupying Iraq. Barack Obama: I will only send our troops into harm�s way when necessary. Joe Biden: Al-Qaeda & the Taliban have regrouped due to Bush�s neglect. Bill Clinton: American workers are working harder for less. The above quotations are from Speeches at Democratic National Convention, Aug. 26th-Aug. 28th, 2008.